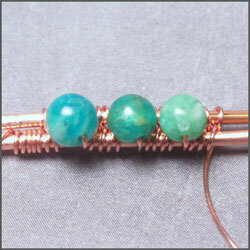 In this lesson I will teach you how to add a bead to a woven project so that the bead lies neatly on top of the weave. 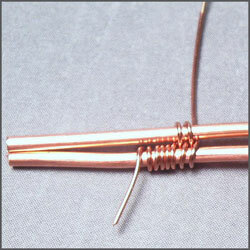 For the illustrations I am using 16g wire for the core wires and 26g wire for the weaving wires. I am using these larger wires so that the detail is easier for you to see. 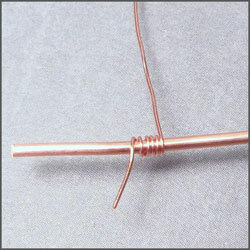 You can also use this technique with smaller or larger wires. 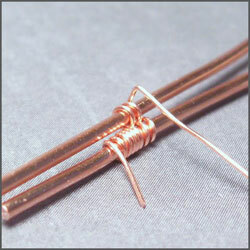 You will start with 2 pieces of 16g wire that are approximately the same length. The actual length does not matter at this point, as this is just a practice piece. Secure the 26g wire onto one of the 16g wires by wrapping it a few times. Begin weaving around both wires in a figure 8 pattern. Once you reach the area where you want to place a bead, stop weaving. You will need to bend the wire at a 90º angle. To find where to make the bend, determine the size of the bead, and cut that number in half. For the illustration, I am using 4mm beads. So on this piece I made the bend approximately 2mm above the core wire. 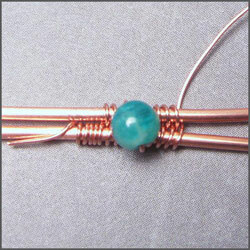 Slip the bead onto the wire and slide it all the way to the bend you created in the previous step. 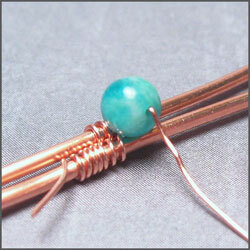 Then bend the free end of the wire down against the bead. Bring the weaving wire down and wrap it underneath both of the weaving wires, so that it comes back up on the other side. Continue weaving in the same figure 8 pattern as before. Continue to add beads as you go along at the desired distance apart. In the example to the right, this technique was used extensively to create unusual borders along the entire piece. 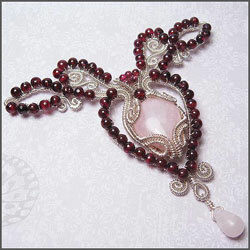 You can space the beads close together for a more dramatic appearance, or farther apart for a more formal designs. 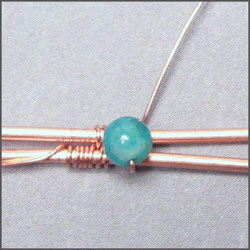 Using different sizes of beads and wire gauges also helps to create many different looks using the same technique.